Located on Historic Route 66. Minutes from Balloon Fiesta Park and NM State Fairgrounds. Less than 10 miles from the Albuquerque International Airport. Also near the Sandia Peak Ski Area and Tram. 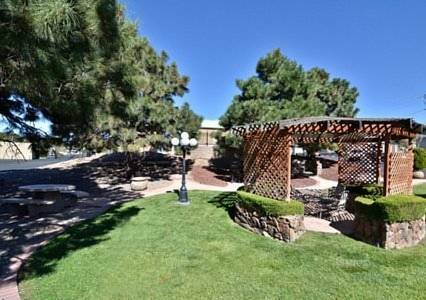 Direct access to the Nob Hill Shopping District, University of New Mexico, and Old Town Albuquerque. Walking distance to shops and restaurants. - Museum of Nuclear Sci. Lots of rattlesnakes behind glass. Feeding time is always a treat, but not for the mice. Every September, a 100-foot-tall paper man, stuffed with sad notes from Santa Fe townspeople is set afire on a hill overlooking the city. Miraculous Catholic shrine in New Mexico. Many attest to the spiritual and physical curative powers of faith in the sacred dirt.